Do you need reusable or permanent paperback covers? Reusable book covers can be applied over the book covers without permanently altering or adhering to the book in any way. These can be removed and reapplied to other books of the same size. Permanent book covers are usually self-adhesive and are applied over the book covers, therefore permanently altering the book. These covers cannot easily be removed without damaging the book. Do you prefer rigid or flexible permanent paperback covers? Rigid (permanent) book covers protect the book while adding stiffness to the covers, giving them "hardback qualities" so the books will "stand-up" better on shelves. Flexible, permanent covers offer protection to the covers without changing the paperback books’ flexible qualities. Do you prefer vinyl, polyester, or polypropylene film? Vinyl: (PVC) Has the advantages of being very soft so it conforms easily, and it’s also inexpensive. Polyester: Chemically stable, acid-free and very strong film with high internal strength. Recommended for archival use. Polypropylene: Economical, chemically stable, acid-free, soft and flexible film. All are available in a variety of film thicknesses and some are available in clear or matte finishes. Most of the adhesives used on self-stick paperback book covers feature a delay-bond adhesive that will temporality allow repositioning during application to correct placement errors. The adhesive will become permanent after several hours. More economical flexible laminate covers are recommended for short term use paperbacks, such as annually updated editions or popular author "trade" paperback books. Rigid laminate covers are recommended when the paperback is a large size non-fiction book that is being added to the library’s permanent collection and will be shelved along with hardback books. Reusable covers are recommended for use on educational or reference material that will be updated or replaced annually but are frequently handled. The covers can be removed from the old editions and placed on the newest editions when received. Most paperback book covers sold in the Brodart catalog include application instructions. Short versions of these instructions are shown in the catalog. 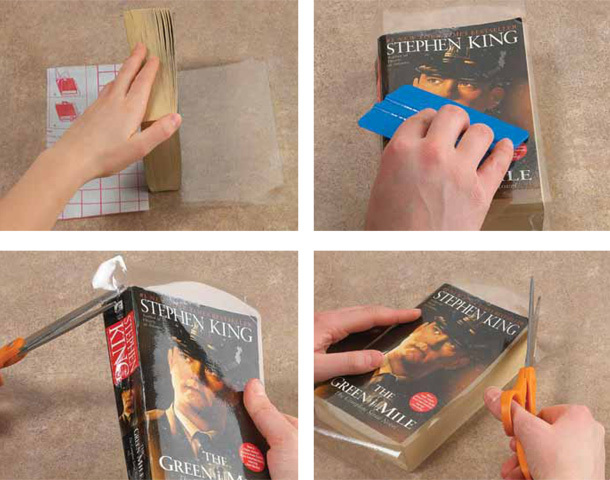 Reusable paperback covers are sold in exact sizes and usually slide onto a book in two pieces that are then joined together with attaching tape that does not touch the book. These covers can be removed and reused on other books. Permanent paperback book covers are usually sold in several sizes that are cut or trimmed to fit the book height. They also feature a self-adhesive, delay-bond adhesive that allows repositioning to eliminate place errors during application, but the adhesive cures permanently several hours after application so the covers cannot be removed without damaging the book.